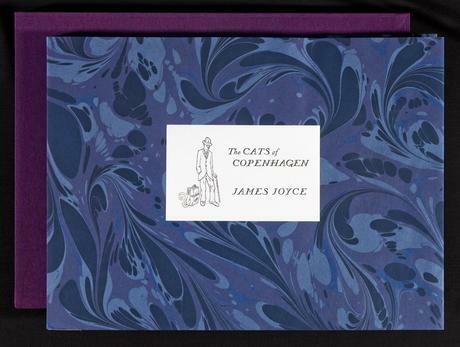 SEVENTY-SIX YEARS AFTER IT WAS WRITTEN, and forty-eight years after the publication in picture book form of his first children's book (We Too Were Children's first blog post ever), James Joyce has another children's book out: The Cats of Copenhagen. If you have €300-€1200 that is. Like his first children's book, The Cat and the Devil, The Cats of Copenhagen was written in a letter to James Joyce's grandson Stephen while Joyce was living in Denmark and his grandson in Paris. Unlike The Cat and the Devil, which originally appeared in Joyce's collected letters, The Cats of Copenhagen has not been previously published in any form. This new edition was made possible, according to the publisher Ithys Press, when James Joyce's works entered the public domain in Europe on January 1, 2012. That position has sparked some controversy, however, as the owner of the letter, the Zurich James Joyce Foundation, claims that it has yet to be determined if unpublished works are also in the public domain. The Ithys Press edition is to be published in limited edition of 200 copies: 26 lettered, 170 numbered, and 4 Hors Commerce. Here's hoping a popular edition will be published soon. All images are copyrighted © and owned by their respective holders.